With a humble name as "Blackbeard's Spitoon", one might think the Pirates had low expectations in 2010. Quite the opposite. The small but experienced crew of five seniors and one freshman combined a dizzying array of innovative mechanisms and creative control software (somehow overlooked by the judges - again - sigh) with an excellent strategy: DEFENSE! Several swabs pounced all over the soccer theme because they played on the high school soccer team. They knew right away that the player most capable of influencing the outcome of every soccer match is the goalie. They designed Blackbeard's Spitoon to be an awesome defensive robot capable of scoring some full-court goals occasionally. The results were impressive. Blackbeard's Spitoon held the opposition to two points or less in every qualifying round match. They gave up nine total points in the nine qualifying round matches, but only finished in 21st place with a 4-3-2 record (goalies don't win many soccer games by themselves). Despite its low ranking after the qualifying rounds, the Spitoon's amazing defensive prowess drew some critical acclaim from afar. Team 1540, the Flaming Chickens from Portland Oregon, brought a high-scoring robot and an excellent scouting network to Denver. Their 4th place finish in the qualifying rounds allowed them to choose nearly any robot for their alliance - and they chose Blackbeard's Spitoon. 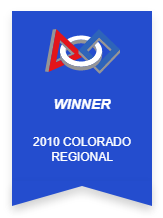 They later added another very capable scoring robot (team 2036 from Fairview High in Boulder) - and thus was born a fearsome alliance capable of excellent offense and defense. Despite some worthy competition in the tournament, the diverse Chicken-Pirate-Knight alliance won the tournament and earned the right to compete in the World Championships in Atlanta three weeks later. Attending the Championships in Atlanta was a long-shot for the Pirates (and the Knights) due to lack of funds. Fortunately, our fantastic supporters within the Nederland community came to the rescue. Rising to the challenge, friends and family in town donated nearly twice the amount needed for the registration and travel fees - and all in one week. Blackbeard's Spitoon sailed to Atlanta and decimated the opposition, nearly notching a perfect 10-0 record in the Galileo division. We lost one close match due to a field entanglement, one due to penalties, and the final match because we forgot to remove a safety pin that prevented our broadside cannon from firing (despite that embarassing oversight, we Pirates do still believe in safety first). Our 7-3 record earned us a finish somewhere between 17th and 32nd place (the ranking formula was complicated) out of 100 teams in the Galileo division, but somehow we were not selected for the final tournament (obviously few teams have scouts as good as team 1540's). Our greatest off-the-field successes in 2010 were probably the friendships we forged with other amazing teams/students/mentors and the experiences of our five graduating seniors. All are capable of great things in life, so keep an eye out for these former Pirates.